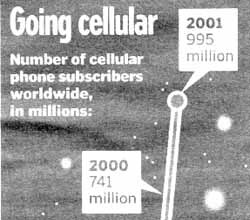 According to this graphic from the December 3, 2002, edition of The Kansas City Star, the number of cell phones in 2001 was at least 995,000,000,000,000 (nearly one quadrillion), or enough for every one of us six billion people on Earth to own 165 each. I still don't have one, so you if you're average you must have 329 extras. Update of 2010: On February 8th I took delivery of my third cell phone, a Motorola Droid. If you own a smart phone with the Android operating system, you might find my page here useful.